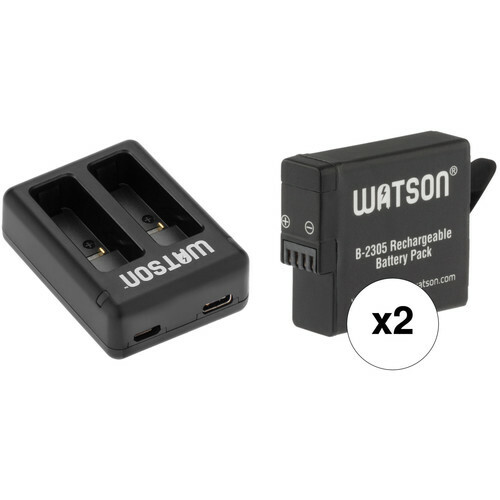 This Watson Mini Duo Charger Kit with 2 x Batteries for GoPro HERO7, 6, and 5 from B&H provides you with two batteries for your GoPro, and a dual charger. This enables you to shoot and charge two batteries at the same time. The charger supports both USB Type-C and micro-USB cables, allowing you to charge from a variety of USB devices. The charger includes a micro-USB cable, so all you need to charge is a readily available USB power supply. The two included batteries can be used to power the HERO5, HERO6, and HERO7 Black cameras. They feature 1250mAh capacity—greater than on the battery that came with your camera—and are a perfect fit for your GoPro. A small pull tab aids in pulling the battery from the camera body. Simultaneously charge two GoPro AABAT-001 type batteries from USB power sources with the Watson Mini Duo Charger for GoPro HERO7/6/5 Batteries. The Mini Duo features dual battery bays and allows you to charge a single battery or two at a time. A separate LED indicator for each bay displays charge status of each battery at all times. The charger offers both USB Type-C and Micro-USB power ports, allowing you to connect to a USB source with cables matching either port. A Micro-USB cable is already included, so you have everything you need to connect to a USB adapter, your computer's USB port, or other USB power source. Note: For best charging results, charge battery when less than 50% full. The Watson Rechargeable Battery for HERO7, 6, 5 Black & HERO 2018 works with the same cameras as the GoPro AABAT-001. This replacement battery pack features a capacity of 1250mAh and 3.85V of output power. Small and lightweight, lithium-ion batteries can be charged or discharged at any time without developing memory effects. Box Dimensions (LxWxH) 7.0 x 4.0 x 1.5"
Box Dimensions (LxWxH) 6.6 x 3.2 x 0.4"
Has anybody tested these batteries with hero 7 black? I use them. Haven't have any issues or concerns with them. They work, although I haven't tested to see how long they last, but seem to work as long as the original battery.